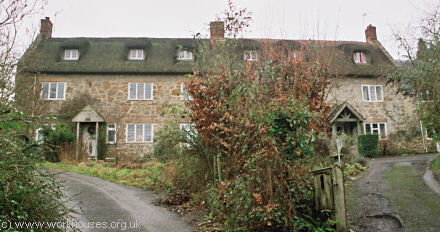 Following an endowment from Gilbert Adams, Beaminster's first workhouse was built in 1626 at Allen's Loscombe, Powerstock. It was rebuilt in 1737, then converted to a school-room in 1836 after the new Union workhouse was inaugurated. A parlimentary report of 1777 recorded a parish workhouse in operation at Beaminster for up to 100 inmates. 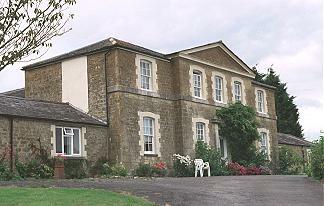 Netherbury had a parish workhouse on St James Road. The appropriately named North Poorton had its own parish workhouse. North Poorton former parish workhouse. Marshwood presumably had a poorhouse in the vicinity of Poorhouse Lane which runs between Taphouse Farm and Charing Cross, a mile to the west of Shave Cross. Dorset: Beaminster (3), Bettiscombe, Broadwindsor (2), Burstock, Chedington, East Chelborough, West Chelborough, Corscombe, Evershot, Halstock, Hooke, Mapperton, Marshwood, Melbury Osmond, Melbury Sampford, Mosterton, Netherbury (2), South Perrot, Pilsdon, Powerstock (2), North Poorton, Rampisham, Stoke Abbot, Wraxall. Later Additions: Seaborough (from 1895), Thorncombe (from 1896) Somerset: Misterton, Seaborough. The population falling within the union at the 1831 census had been 13,869 with parishes ranging in size from Seaborough (population 41) to Beaminster itself (2,968). The average annual poor-rate expenditure for the period 1833-36 had been £7,541. The new Beaminster Board of Guardians met for the first time on 6th April 1836 at the Red Lion Inn. At a later meeting they resolved "that the several Workhouses within this Union, viz. Beaminster, Broadwindsor, and Netherbury, be appropriated to the use of the Union, and that the salaries of the respective governors be as follows, viz. Mr Guppy at Beaminster, at the rate of £60 per annum, Mr Hardy at Netherbury £45 per annum, Mr Day at Broadwindsor £30 per annum." The new union workhouse was built at Stoke Water, about a mile to the south-west of the town. The two-acre site, then known as Carrot Close, was bought from Samuel Cox Esq. at a cost of £315. The new building was designed to accommodate 230 inmates and cost around £4,500. The builder was Richard Warr and the architects were HJ Whitling and Edward Mundey. The architect's fee was 3½ percent of the building cost, which amounted to just over £157. The total cost of the new establishment was thus just over £5,000. 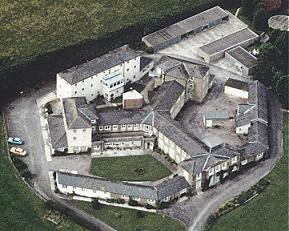 The workhouse design was a modified, somewhat "squashed", form of the popular hexagonal "Y" plan — somewhat resembling an anchor in appearance, as can be seen on the aerial view below. The new workhouse was opened for occupation on 24th June, 1838 with Mr and Mrs Guppy as Master and Matron, for which they received a salary of £60 per annum "and such provisions as the house may afford." The Guardians met in their new Board Room at the workhouse five days later. Amongst their early appointments were Richard Whitty as porter at £5 per annum, John Cox as schoolmaster at £7 per annum, and Sarah Hayward as schoolmistress at £15 per annum. The following Christmas, the Guardians ordered "that the inmates have plum pudding and I beer on Christmas Day." However, four years later, on December 26th 1843, it was recorded that "the male inmates request the Master to report their intention of petitioning for more food." In 1846, because of a shortage of potatoes caused by crop failure (this was the period of the potato famine in Ireland), rice was substituted in the diet. In 1849, the infirmary at the north of the workhouse had wings added at a cost of £190, and had a second storey added in 1863 at a cost of £198. In 1850, a tailor's shop was built and oakum-picking was introduced. In 1852, the first infirmary nurse was appointed. Also that year, the old and infirm were allowed tea with their evening meal. Beaminster workhouse from the south, c.1910. 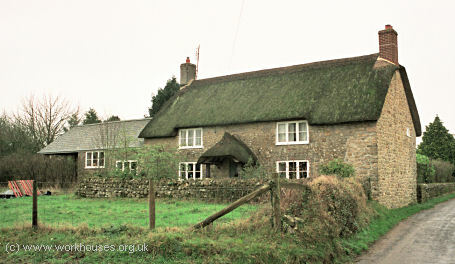 Beaminster from the south, 2000. Extracts from the "Pauper Offence Book"
Elliott, Benjamin Neglect of work 31 May 1842 Dinner withheld, and but bread for supper. Rowe, Sarah Noisy and swearing 19 June 1842 Lock'd up for 24 hours on bread and water. Aplin, John Disorderly at Prayer-time 22 July 1842 Lock'd up for 24 hours on bread and water. Mintern, George Fighting in school 26 July 1842 No cheese for one week. Greenham, Mary and Payne, Priscella Quarreling and fighting 14 Dec 1842 No meat 1 week. Bartlett, Mary Breaking window 21 Mar 1843 Sent to prison for 2 mths. Park, James Deserted, got over wall 4 Sep 1843 To be whipped. Hallett, Isaac Breaking window 25 April 1844 Sent to prison for 2 months hard labour. Staple, John Refusing to work 7 Jany. 1856 Committed to prison for 28 days. Johnson, John Refusing to work 19 Oct 1858 Cheese & tea stop'd for supper. Breakfast stop's altogether. Soaper, Elizabeth Making use of bad language in bedroom. Trying to excite other inmates to insubordination. Refusing to work. 17 Jany. 1863 Taken before the Magistrate & committed to prison for 14 days hard labour. Note by Chairman of the Guardians: "Would not 28 days be better—J.F.?" Things were not entirely grim, however. On March 10th 1863, there was a "Dinner to Inmates to commemorate the Wedding Day of the Prince of Wales, similar to that given on Christmas Day." The following year, vagrant wards were erected to accommodate six men and four women. Each tramp was allowed 7 oz. of bread for supper, and the same for breakfast. DAY OUT. On Monday, the children of Beaminster Union were given a real treat. About 10 O'clock they were conveyed in a brake from Beaminster to West Bay. they were accompanied by Mrs JB Dunn, Miss Hine, Mrs Andrews the Matron, and Miss Bevan the industrial trainer, who did all they could to see the little folks had a happy day. Between meals they enjoyed themselves on the beach as only children can. Mrs Dunn, who with her husband takes a keen interest in the welfare of the Union, provided a capital tea. Beaminster from the west, 2000. In 1907, two rooms in the workhouse were converted into a chapel. By 1912, when the workhouse became officially known as Beaminster Poor Law Institution, it seems to have been functioning mainly as an infirmary. Its official accommodation capacity was now reduced to 130, with room in the tramp wards for sixteen men and three women. WORKHOUSE TUNES. The question of installing a wireless set at the Poor Law Institution was further considered at the meeting of Beaminster's Board of Guardians. One of the difficulties that has confronted the Guardians has been that of keeping Officers at the House because of its out of the way position. Mr Johnson stated that, as it was only an experiment, it would not be advisable to spend more than 30 guineas on a wireless set. Mr Angus said that he understood that a wireless was to be installed with a view to making the inmates happy as well as the nurses. Capt. Digby said that before it was installed it would be well to know the doctor's opinion as to how a wireless would affect the sick in the infirmary. Dr Pim thought it would cheer the inmates up. 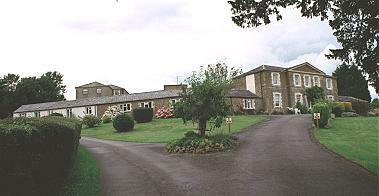 In 1930, the workhouse became Beaminster Public Assistance Institution. During the Second World War, it was taken over for use as military accommodation. 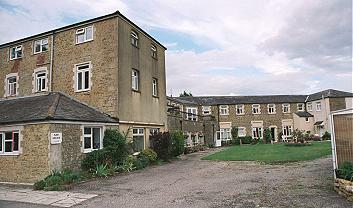 Afterwards it became Stoke Water House, an elderly persons' home, until being converted into flats in 1974. Dorset History Centre, Bridport Road, Dorchester DT1 1RP. Holdings include: Guardians' minute books (1836-1930); Pauper Offence Book 1842-69; etc. Thanks to Ruth Lyons and Chris Etherington for help in compiling this page.